He has been working at the Department of Applied Mathematics since 2008. Education: Graduated from the National Technical University “KhPI”, Physical Engineering Faculty (2008), his major is «Dynamics and strength». In 2008 entered PhD cources at NTU “KhPI”, successfully graduated in 2011. PhD degree he received in 2013 (thesis: “Nonlinear normal modes of forced oscillations and their application in dynamics of single-disk rotors”). Career: During 2008-2013 N. Perepelkin holded positions of Assistant Lecturer, Engineer, Junior Researcher. Since 2013 he has been working at position of Assistant Professor. Scientific interests: non-linear dynamics of mechanical systems, in particular, dynamics of finite-DOF systems, nonlinear normal modes theory, rotordynamics. He has more than 30 scientific works. Perepelkin N.V. Analysis of forced vibration modes of single-disk rotor with non-linear supports (in Russian) / N.V. Perepelkin, Yu.V. Mikhlin // Rigid body mechanics. – 2010. – №40. – p.221-232. Perepelkin N.V. Modified method of calculation of non-linear normal modes of forced vibrations and its application in rotordynamics (in Russian) / N.V. Perepelkin, Yu.V. Mikhlin // Rigid body mechanics. – 2011. – №41. – p.109-121. Perepelkin N.V. Construction and stability analisys of resonance vibration modes of a single-disk rotor with non-linear supports (in Russian) / N.V. Perepelkin, Yu.V. Mikhlin // Dynamical systems. – 2011. – vol.1(29). – №2 – p.269-280. Perepelkin N.V. Non-linear normal forced vibration modes in systems with internal resonance / N.V. Perepelkin, Yu.V. Mikhlin, C. Pierre // International Journal of Non-Linear Mechanics. – 2013. – vol.57. – p.102-115. Mikhlin Yu.V. Nonlinear normal vibration modes in the dynamics of nonlinear elastic systems / Yu.V. Mikhlin, N.V. Perepelkin, A A Klimenko, E. Harutyunyan // Journal of Physics [електронний ресурс]. – 2012. – Volume. 382 (012052) conference 1. – Режим доступа: http://iopscience.iop.org/1742-6596/382/1/012052/pdf/1742-6596_382_1_012052.pdf. Perepelkin N.V. Nonlinear normal modes of forced vibrations in rotor systems/ N.V. Perepelkin, Yu.V. Mikhlin // The Third Int. Conference “Nonlinear Dynamics” (NTU “KhPI”, Sept. 21-24, 2010) : Proceedings. – Харьков, 2010. – с. 170-175. Perepelkin N.V. Nonlinear normal modes of forced vibrations in rotor systems / N.V. Perepelkin, Yu.V. 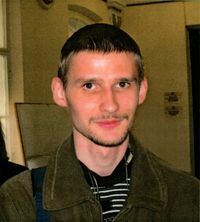 Mikhlin // The 7th European Nonlinear Dynamics Conference (ENOC 2011): Proceedings [електронний ресурс]. – Rome (Italy), 2011. – 6 p. – Режим доступа: http://w3.uniroma1.it/dsg/enoc2011/proceedings/pdf/Perepelkin_Mikhlin_6pages.pdf. Perepelkin N.V. Nonlinear Normal Modes in the Rotor Dynamics / N.V. Perepelkin, Yu.V. Mikhlin, E. Harutyunyan // The Fourth Int. Conference “Nonlinear Dynamics” (Jun. 19-22, 2013, Sevastopol, Ukraine) : Proceedings. – Харьков, 2013. – с. 152-158.